The principal of the Rotor Gas Meter is well known. It is a positive displacement type of meter, passing pre-determined volumes of gas by means of two counter-rotating rotors or impellers. The bearings are placed outside of the timing gears. There is no bending, twisting or torque affects. Square shaped impellers and rigid supporting front plate, this makes this meter fully insensitive to pipe-line stresses caused by misalignment. The unique symmetrical shape of the impeller allows the maximum amount of gas to be passed with the minimum leakage and since the width of the impeller tip is at least two times greater than conventional impeller tips, the unregistered leakage through the meter is significantly reduced, resulting in an enlarged turn down ratio. Robust design – no bending, twisting or torque affects, resulting in a stronger connection between the impellers and far less venerable to improper operation. 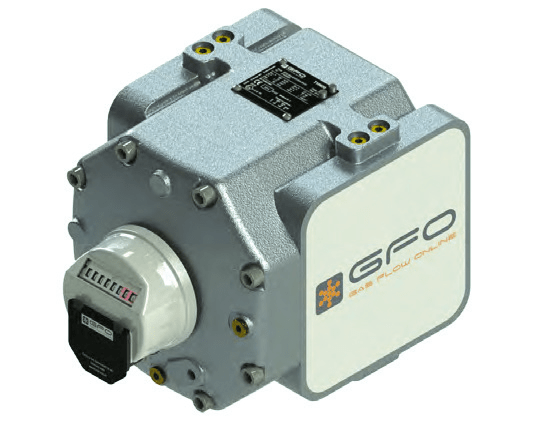 Multifunctional coupling – To eliminate limitations to future upgrades both the GFO-RM series and the GFO-TM series are equipped with a hybrid magnetic coupling. Sync impeller principle – eliminates nearly 100% of pulsation increasing lifetime of the meter, reduces noise and improves accuracy. Media: Natural gas, town gas, propane, inert gases. A positive displacement type of meter, passing pre-determined volumes of gas by means of two counter-rotating rotors or impellers.